We’ve partnered with Best Buy to share awesome information about the Modal Concept Tote! iPads, keys, fitness gear, laptops, wallet, water bottles, headphones, makeup…the list never stops for what you need to haul around with you every day. Oh! And snacks. We can never forget snacks. For all of that, you need the ultimate tote and we think we have found it! The Modal Concept Tote from Best Buy seems to be the solution to having an organized tote that is also sturdy and secure. With Mother’s Day just around the corner, my first thought when I received this bag is what a great Mother’s Day gift this would make. This bag is not only versatile and sturdy, but with its beautiful, vibrant color, it is actually quite stunning for a tote. I have several totes but this bag quickly has become my favorite. Versatile – this bag can go from the gym to the office. It has discreet, water-resistant pockets to store your wallet and other valuables and protect them from damp clothes. Fantastic laptop storage – it has dedicated, secure and padded sleeves for both laptop and tablet storage with quilted soft-touch lining. Moisture resistant – heavy duty, moisture-resistant fitness pocket has plenty of room for your workout clothes and is vented to promote air circulation. Thermo Pocket to keep your food hot or cold. Space to store warm hairstyling tools. Padded, adjustable shoulder strap – Along with 2 handles for comfortable carrying. Perfect storage for your shoes or other items you want to keep separate from sensitive items. I really have fallen in love with this Modal Concept Tote bag from Best Buy. I am taking a trip in a few weeks and this will accompany me on the plane. I can’t think of a better way to organize and carry what I need on the plane and when I am traveling once I reach my destination. Straps for towel or yoga mat storage. Plenty of room for a laptop and all of the essentials! You still have plenty of time to purchase this Modal Concept Tote for a Mother’s Day gift for your wonderful mom to show her how much you appreciate her. Trust me, she will absolutely love it! This would also make a wonderful birthday present for your mom, sister or best friend! Best Buy has free shipping on orders $35 and up and free store pickup. You can pick up your order in as little as 45 minutes. Please ReTweet so everyone can see what a great gift the #Modal Concept Tote from @BestBuy will make for your mother this Mother’s Day! I need one of those in my life. That sounds like the perfect totebag for me. It really is. I am so impressed with this. I never knew Best Buy had products like this. I though they only carried televisions and computers and of course kitchen appliance. My gosh, this tote really does have all the best features! I think I need to replace my crummy drawstring backpack with one of these cute totes! What nice bag. I love that purple color too and it’s even nicer that it is waterproof. Yes I love that it’s waterproof. And the color is so pretty. 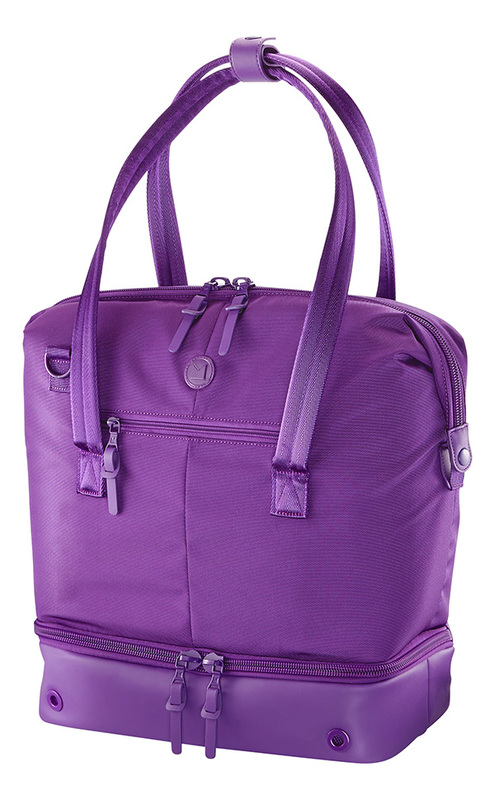 Looks like a great workout bag but definitely perfect for the avid traveler. I usually travel in sneakers then change once I get to my destination. What an awesome bag! I want this to use as a diaper bag! I think it would make a great diaper bag too for those that have little ones. I NEED this tote!! It is so well designed! I also wasn’t aware that Best Buy carried products like this? 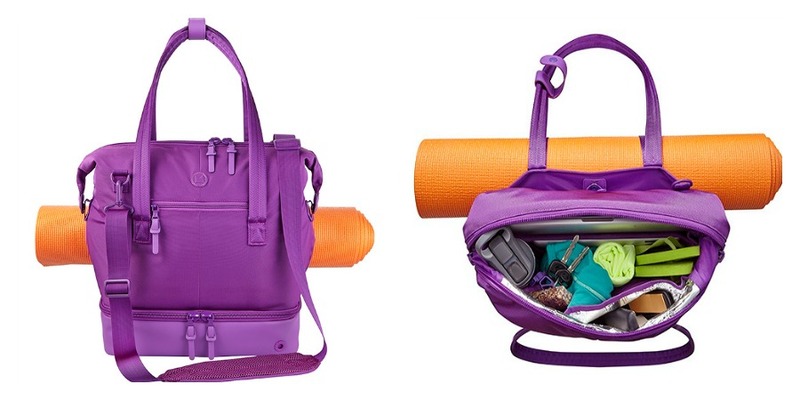 This is an amazing gym bag or even travel bag too. 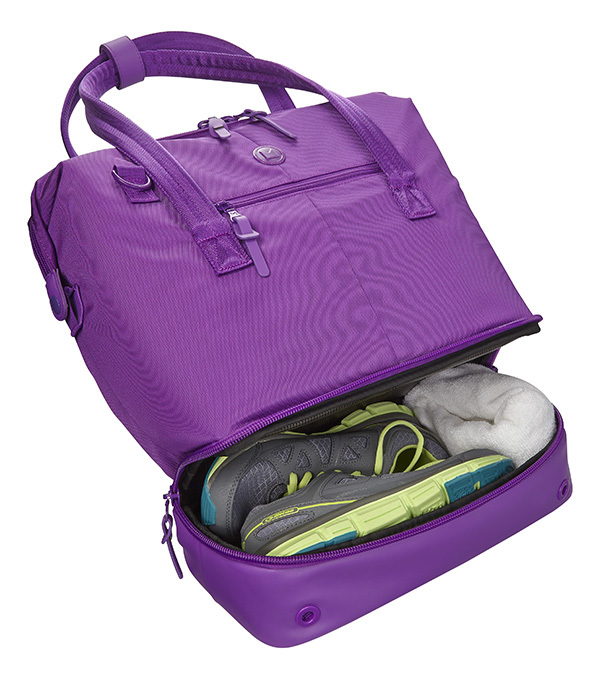 I love that it carries your sneakers as well so that I dont have to bring them in a separate bag with me to the gym..great for moms too since they always have to carry so much stuff!! That’s such a cute looking bag and it’s so useful. I could use it for so many things! I love the look of this bag! I also really love the color! So pretty and looks like it would fit a ton! What an awesome tote. I love the storage space on the bottom! I guess it’s time to start hinting to the kids! I’m surprised that Best Buy sells this! I’d probably use it for my camera. I can see using it for your camera, but I have a small camera. This tote would fit mine plus a lot more. This looks like the perfect bag for me. I love the color. It has so much room to carry all my essentials. It does have a ton of room. I love the color of that tote. I could use one of these! I would love one of these! I love how it has the extra section for shoes and other things and the colour is great too! I’m so totally in the market for this. I need a laptop bag desperately, but I haven’t been able to get anyone to get one for me, so I think I’ll be making a trip to Best Buy. This is so perfect for me! My husband jokes all the time that I need a duffle bag for all of my stuff. Not really. I just need a Modal bag. Love the way this tote bag is designed. The extra compartment for shoes is genius! What an awesome tote! I love that it even has storage in the bottom. This looks like a great tote. I really like the compartment on the bottom for the shoes. This would be so handy to have around for blogging. Oh and I love the color! This tote looks like it is perfect for traveling. It has a lot of space and it is very stylish at the same time. Such a lovely tote bag with one of my favorite color to top it up. Glad to know that it is water proof and it has extra space for shoes as well. I really need this one for me. Will have to check this out. I’m so impressed by this tote. It holds EVERYTHING! What a beautiful tote. It’s super roomy and a great bag to look into getting. I am so in love with that bag! I need it for my yoga sessions! I’m not a gym rat, but could definitely put this bag to great use. I never would have considered storing my laptop and lunch in the same place, but this makes it possible. I hate carrying around multiple bags, so one to do it all would be great. I am so loving this, I need this lol. I love the fact that I can seperate my sneakers from my workout clothing or other personal items and still have space in the back to carry my mat.. nice! I never thought such a cute tote would be at Best Buy. What a great idea!! What an adorable bag! It’s stylish and versatile. You can’t beat that. I would be so excited if I was gifted this for mother’s day!! This is an awesome bag! I love that it has a separate place for smelly shoes LOL 🙂 And the color is just amazing. This is an everywoman tote bag. It’s hard to imagine anyone not wanting it. The color and the features make it perfect for any occasion. That’s like a magical bag! Everything you need fits rightt in perfectly. I like that the bottom is separate like that for storage. This tote looks great for travel. I need this bag in my life. I don’t work outside the home, but this would be the perfect bag for me when I do road trips. That’s probably the coolest tote Ive seen in a really long time! It doesn’t hurt that it’s an awesome color either! That is a beautiful shade of purple and a handy bag. Thanks for sharing! This is such a neat tote–I would love to get one for myself! I love this and also I love the color. I LOVE this bag!! I’m going to buy it for myself if no one takes the hint and gets it for me for Mother’s Day. The bright purple is perfect for me. I’d get it for my mom, but she is all about earth tones. I absolutely love that bag. It doesn’t look like it has so much room in it but them I see the bottom section. Very nice.